Due to the efforts of authentic lineage masters such as Khentrul Rinpoché, the conditions are starting to manifest for disciples around the globe to receive the profound pith instructions of the Kalachakra Completion Stage. In order to safeguard the blessings of these most precious of teachings, the High Lamas of the Jonang Tradition such as His Holiness Tulku Jigmé Dorjé and His Holiness Khenpo Sherab Saljé, have issued a statement with respect to how the pith instructions should be disseminated. Khentrul Rinpoché would like all of his students to respect and honour the tradition by acting in accordance with this policy. For this reason, he has included the full translation of the letter below. Please share this information with anyone that you believe would find it relevant. If you have any questions regarding this letter, direct your inquiries to: contact@khentrulrinpoche.com. “What is clearly taught in many sutras and tantras was expounded by the Omniscient One Possessing the Four Reliances, Dolpopa Sherab Gyaltsen, as the profound dharma of the hermits whose minds are devoid of the eight mundane concerns, just like a symphony of cymbals, in the treatise entitled ‘The Mountain Doctrine, Ocean of Definitive Meaning’, which first proclaimed the fearless lion’s roar in the retreats of the snowy mountains of Tibet, the view that unifies the definitive meaning which is the intention of the Third Turning of the Wheel of Dharma and the profound, secret Kalachakra, the King of the Unsurpassable, Secret Tantras. 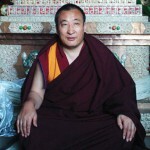 Accordingly, with regards to all the profound and extraordinary teachings of the Glorious Gyalwa Jonangpa, if one practices the proper stages of the gradual preliminaries by applying the three confidences and the four disregards, one will reach without any obstructions the superior state of accomplishment of unmistaken omniscience. Therefore, the Glorious Gyalwa Jonangpa are the genuine holders of the teachings of this practice lineage and have never sought mundane prestige or political prominence. Moreover, if all of these extraordinary and profound teachings are commodified, it won’t be possible to experience the power of their blessings. Therefore, they are bestowed only on disciples who are worthy vessels for the powerful content of the pith instructions, and then, the commitments between lama and disciples are guarded as one protects one’s own life. If one respects the secrecy of the profound meaning and takes good care of the commitments, one will certainly be able to be freed through realization and to swiftly progress on the bhumis and paths. This is not a mere belief. Rather, it is a doctrinal transmission of competent practitioners who kept record of their experiences. Therefore, since rules for spreading the profound dharma in the future are seen as having the utmost importance, the highest teaching of the Vajra Yoga, which is the profound path of the excellent lineage from the northern land of Shambhala must be preserved accordingly. As for the Six Branched Yoga, the Completion Stage of the Kalachakra Tantra, qualified Vajra Masters of the Victorious Jonangpa must gradually lead their respective heart disciples through the common and uncommon preliminaries. For the sake of those who have practiced according to the instructions and who have gradually completed the proper progression, the methods for practicing the pith instructions of the Six Branched Yoga and the associated techniques for removing the obstacles will be translated into their respective languages and then taught. Otherwise, if, recklessly translating all the pith instructions and the associated methods for practicing, we sell them in the market and so on, we don’t know whether this will bring benefit or harm. Thus, anything concerning the pith instructions that have an order-seal of secrecy should never be commodified. Apart from the holders of the teachings of the Victorious Jonangpa, who possess the rights of ownership of these instructions, there are no other individuals nor organizations that have such rights. Therefore, the entire Victorious Jonangpa has decreed that, without the permission of the Lord of the teachings of the Victorious Jonangpa, it is not possible to commercialize this material as one wishes. Written at the Dharma Palace of the Great Eastern Monastery of Dzamthang Tsangwa by the 47th Vajra Throne Holder Tsangwa Geitrul, Supreme Incarnation Jigme Dorje on the 15th day of the third month of the fire bird year during the 17th rabjung (May 10, 2017), on the very auspicious anniversary of the teaching of the root tantra of the Glorious Kalachakra.